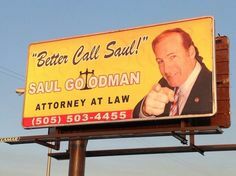 Better Call Saul? You Should Never Hire A Billboard Lawyer! The billboards went up practically overnight. Major roads were covered. The faces, the names, a telephone number. Call us, it said. This firm wants everyone to call with any legal issue. It’s easy to get a billboard. You just need to take a picture and have it plastered on the billboard with a few words and a phone number. Add a few fake awards and you have yourself a marketing winner. Does that make the person a good lawyer? Does it make the person a skilled lawyer you should trust? No. The Huntsville area firm that decided practically overnight to enter the billboard game is a perfect example. It’s an association of attorneys who spent their careers primarily defending clients with small criminal charges. I’m not criticizing their skills as DUI defense lawyers. But, to claim suddenly that you have expertise in entirely different legal areas? I just don’t think it’s right. But, these lawyers want the volume of cases. So, they decided to expand. Suddenly, they started advertising for everything — domestic, immigration, elder law and even personal injury. Really? A DUI lawyer puts up a billboard and begins advising elderly clients concerning inheritance issues. That’s wrong on so many levels. Elder law is a specialized field involving tax issues, Medicare issues and inheritance issues. Families deserve a specialist who has spent years understanding often complicated tax and planning issues. When people seek elder law advice and planning from a non-specialist, their families often pay the real price later. It’s the same with personal injury. I actually went to the website for the new Huntsville billboard firm. The firm now has a personal injury page on its website. Yet, if you scroll down near the bottom of it, the disclaimer is in the fine print. They are going to refer cases to a specialist. What they mean is that they will take your case and try to settle it. If they cannot get a low settlement, they will refer it to another lawyer. Truth in advertising? Absolutely not. Good service for hurting people? No. When a family is suffering through a personal injury, they need a specialist. Any lawyer can put his or her face on a billboard. The hurt person does not need a billboard lawyer who lives off volume settlements. They need a lawyer who will take the time to build their case. This requires a lawyer who specializes in personal injury and has the courage to take the case to trial when needed. The insurance companies know which lawyers simply advertise on television, billboards and radio for cases. Insurance companies love these lawyers. Billboard lawyers usually make quick and low settlements. The insurance companies pay a small fraction of the injured person’s real damages. It’s wrong. It’s very wrong. If you have a serious personal injury and need a serious attorney, ask questions. Ask the lawyer how many serious personal injury cases he or she has tried. Ask the lawyer how long he or she has specialized in personal injury (and not some other area of the law). Ask the lawyer if he or she takes all kinds of cases OR truly specializes in injury cases. Ask the lawyer if he or she has handled personal injury cases at all levels of both trial and appeal. Research the attorney. Does the lawyer simply make advertising promises? Anybody can make a promise. Or, does the lawyer really write, lecture and teach in the field. Don’t settle for the big face on the billboard. Your case is too important.